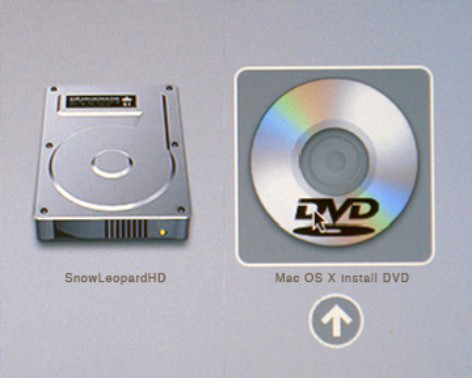 The bootable Mac OS X Snow Leopard Install DVD-ROM is important if your Mac ever refuses to boot like normal. If you don’t have a bootable DVD-ROM — preferably a Mac OS X Snow Leopard Install DVD-ROM — call Apple or your Apple dealer to arrange for a replacement. Insert the Mac OS X Install DVD into the DVD drive. If your Mac uses a tray to hold the DVD, make sure that it retracts and that the disc is in. If you have a tray-loading DVD-ROM drive and it’s closed, you can get it to open by restarting (or starting up) your Mac while pressing the mouse button. Continue pressing until the drive tray pops out; then release. Shut down or restart your Mac. If you shut it down, wait a few seconds and then start it up the usual way. Press and hold down the C key immediately, and keep it pressed until your Mac either boots from the DVD or doesn’t. If it does boot from the DVD-ROM, you see a Welcome screen. If it doesn’t boot, you see a prohibitory sign, spinning-wheel-of-death, or kernel panic alert. . . anything but the first screen of the Mac OS X Installer, the login window, or the Finder. Any of those is your cue to try Step 4. If your Mac doesn’t boot after Step 3, hold down the Option key while booting to display the built-in Startup Manager. Use the built-in Startup Manager when you boot from a DVD. It displays icons for any bootable discs that it sees and allows you to select one (including the installation DVD). Click the DVD-ROM icon to select it, and then press Return or Enter to boot from it. This technique is quite useful if your usual boot disk is damaged or having an identity crisis during startup. If you can’t boot from DVD then either you just installed something new that’s aggravating your Mac, or your Mac needs to go in for repairs (usually to an Apple dealer). Call the tech-support hotline: Before you drag it down to the shop, try calling 1-800-SOS-APPL, the Apple Tech Support hotline. The service representatives there may be able to suggest something else that you can try. If your Mac is still under warranty, it’s even free. Ask a local user group for help: Another thing you might consider is contacting your local Macintosh user group. You can find a group of Mac users near you by visiting Apple’s User Group Web pages. Try Dr. Mac Consulting: You can check out consulting services or call 408-627-7577. A team of expert troubleshooters does nothing but provide technical help and training to Mac users, via telephone, e-mail, and/or Internet-enabled remote-control software. Check whether you have RAM issues: If you have problems immediately after installing random-access memory (RAM) — or any new hardware, for that matter — double-check that the RAM chips are properly seated in their sockets. (Warning: Don’t forget to shut down your Mac first.) With the power off and your Mac unplugged, remove and reinsert the RAM chips to make sure they’re seated properly. If you still have problems, remove the RAM chips temporarily and see whether the problem still exists. Follow the installation instructions that came with the RAM chips — or the ones in the booklet that came with your Mac. But even if they don’t say to get rid of the static spark, you should (by using an antistatic strap available from most RAM sellers or by touching an appropriate surface, such as the power-supply case inside your Mac) before you handle RAM chips.